The ferry simply picks you up at a dock and drops you off on the other dock across the bay. 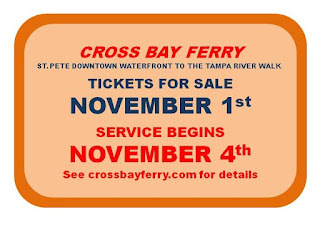 The Cross Bay Ferry not to be confused with the Tampa Bay Ferry and Water Taxi that operates out of John's Pass on Treasure Island, made its inaugural voyage across Tampa bay Tuesday with no regular members of the public just the political elite and their high-roller friends. You can get the Ferry details in the Tampa Bay Times Caitlin Johnson, Times Staff Writer; New NewTampa Bay ferry to make its maiden voyage on Tuesday and in Kriseman's 'dream' comes to life as Cross Bay Ferry makes first trip from St. Petersburg to Tampa (w/video). 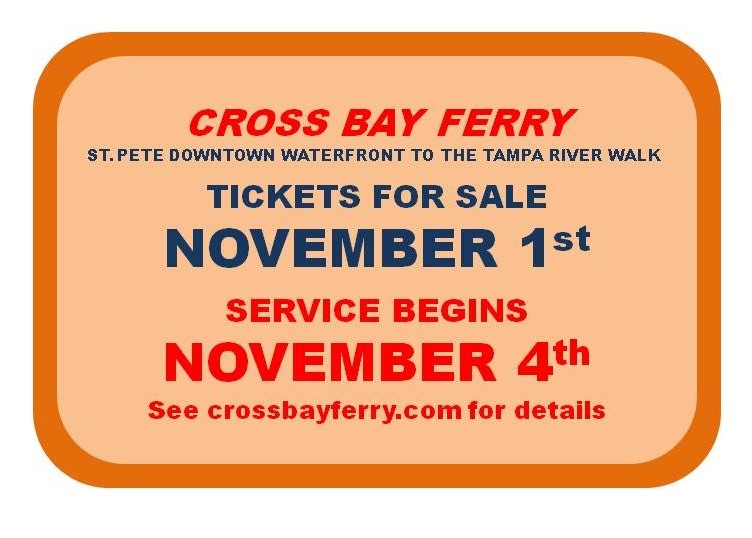 The Cross Bay Ferry is a joint effort with Pinellas County, Hillsborough County, The City of Tampa and the City of St. Petersburg all chipping in to fund the start up. It is a great idea to look at this type of alternate transportation. A pilot project of this nature can define many issues. Principal among them is the last mile issue, which always comes up in point to point public transit. That question simply is how do I get to and back from my actual destination? Cab, bus, UBER, Lyft, walk, bicycle? Hopefully, this pilot project will give some insight into how that problem is solved. The general thinking at the moment is initially the ferry will be a round trip tourist attraction that could possibly morph into a commuter option. The round trip price is $20 per head and by the time, you add parking at your departure site and ground transportation at your arrival site the whole trip could get a bit expensive for daily commuters. It is an interesting idea, probably a waste of taxpayer money, but the thought of Rick Kriseman doing a Leonardo DiCaprio (Titanic) moment in the bow of the Ferry, while directing the captain to dodge the flotsam and jetsam his City dumped into the bay almost makes it a worthwhile investment.